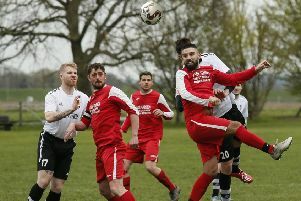 AFC Dunstable closed the gap on leaders Kings Langley as they did the double over their opponents with an impressive 3-0 victory on Saturday. The hosts welcomed back Newman Carney, Jimmy Hartley and Leon Simpson, with Jamie Warne moving to the wing and Taishan Griffith dropped to the bench. AFC were ahead on 11 minutes when Chris Francis chased a lost cause and finished coolly. It was 2-0 on 42 minutes when Carney’s dangerous free kick caused problems and Jermaine Hall was on hand to poke the ball home. Langley were then reduced to 10 men as former AFC midfielder Lee Burgoyne picked up his second yellow for another foul on Moses Olaleye. The game was put to bed on the stroke of half time as Hall escaped the attentions of Stuart Deaton to find the net. After the break, Kings Langley began asking more questions as keeper Louis Porcelli had to make a comfortable save, before the leaders were denied by the woodwork. Late on, Hall had the chance to complete his hat-trick but fired over the crossbar, while substitute Enzo Silvestri was also off target. The result saw AFC, who host Hertford Town tonight, climb up to fourth and to read manager Steve Heath’s comments, see the News/Gazette on sale now.